This lodge is situated on a working farm on the outskirts of Bishops Nympton, near South Molton, and can sleep six people in three bedrooms. 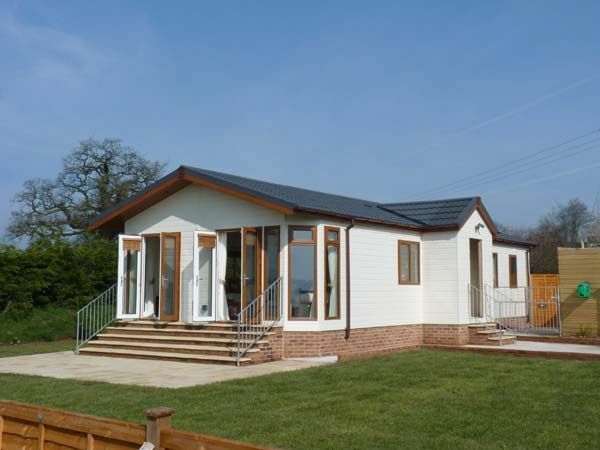 Elworthy Lodge is a lodge situated on a working farm on the outskirts of Bishops Nympton, just 3.5 miles from South Molton, in North Devon and can sleep six people. This cottage has three ground floor bedrooms; a king-size double with an en-suite shower room and two twin bedrooms (one with 2 6 beds). There is also a bathroom, an open plan living area with a kitchen, a dining area and a sitting area with an electric fire and there is also a hall for boot storage. Outside there is off road parking for two cars and an enclosed lawned garden with furniture. Elworthy Lodge is a wonderful holiday base. Amenities: Gas central heating with electric fire. Electric oven and gas hob, microwave, fridge/freezer, washer/dryer, dishwasher, 2 x TVs with Freeview, DVD. Fuel and power inc. in rent. Bed linen and towels inc. in rent. Off road parking for 2 cars. Enclosed lawned garden with furniture and area for dogs with kennel. Two well-behaved dogs welcome. Sorry, no smoking. Shop 9 mins walk, pub 2 miles. Note: Although all ground floor, this property isn't suitable for wheelchair users. Town: South Molton is an attractive market town, often referred to as the Gateway to Exmoor, and ideally situated in North Devon. The town offers a selection of shops and amenities and there is also a weekly market. All ground floor. Three bedrooms: 1 x king-size double with en-suite shower, basin and WC, 2 x twin (one with 2’ 6” beds). Bathroom with bath, shower over, basin and WC. Open plan living area with kitchen, dining area and sitting area with electric fire. Hall for boot storage. Gas central heating with electric fire. Electric oven and gas hob, microwave, fridge/freezer, washer/dryer, dishwasher, 2 x TVs with Freeview, DVD. Fuel and power inc. in rent. Bed linen and towels inc. in rent. Off road parking for 2 cars. Enclosed lawned garden with furniture and area for dogs with kennel. Two well-behaved dogs welcome. Sorry, no smoking. Shop 9 mins walk, pub 2 miles. Note: Although all ground floor, this property isn't suitable for wheelchair users. Great accommodation, lovely hosts and fine countryside, what more can you ask? Dogs thought it was great and settled in immediately. Farm dogs very friendly so all in all a great time was had by all. This was our second visit and it just keeps getting better!